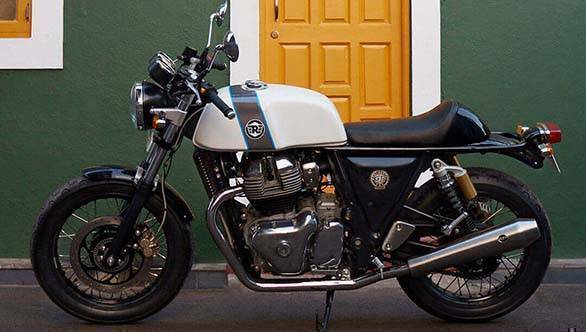 The Royal Enfield Continental GT 650, we know now, will be the more expensive of the two 650 Twins that Royal Enfield is in the process of launching right now. The United States market is the first, and only market to have received pricing so far. And two things are clear. First, the chrome tank models on the Continental as well as the Interceptor 650 are the most expensive trim models. And second, the Interceptor is less expensive by about USD 200, about Rs 15,000. That is on a base price of about Rs 4.5 lakh there, so the difference is not significant. Let's look under the skin, shall we? Royal Enfield clearly set out to make just the one bike, cast in the mould of a roadster and a cafe racer, explained Siddartha Lal, CEO Eicher Motors. He believes that given how new the all-new bike project was for Royal Enfield, not thinking of the 650 as a platform helped focus effort and time. We do believe that, for example, a Himalayan 650 and a Scrambler 650 (our placeholder name, not Enfield's) will follow. But what Lal was underlining is the reason for how similar the two motorcycles are. 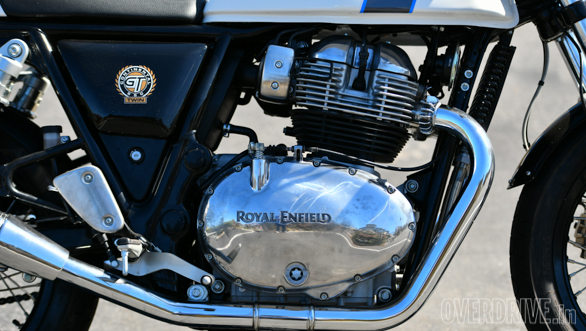 So the air/oil-cooled fuel-injected 648cc parallel twin is a simple eight-valve SOHC unit that is shared across both, the Royal Enfield Continental GT and the Interceptor 650. There isn't any difference in the two, and the six-speed gearbox, gearing and the slip-assist clutch are common too. I was surprised to realise that the frame is the same as well but Royal Enfield's chassis development team explained that while even the suspension is the same, the Continental GT runs slightly higher preload than the Interceptor which sharpens up the motorcycle by a tiny, but crucial bit. The brakes and tyres are all identical and the only other changes are that the Interceptor has a standard center stand, which the Continental GT does not. 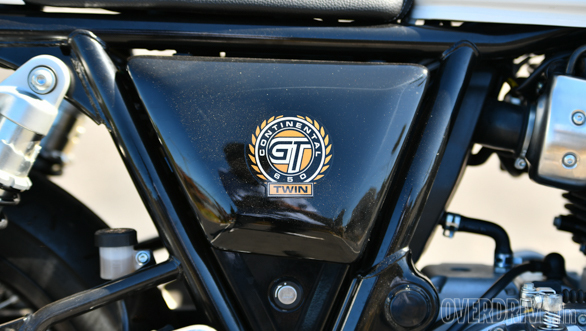 The top yoke on the GT is designed for clip-ons and of course, there are clip-ons on a small riser mounted under the top yoke to the forks. The seat unit is different - the stock seat uses the same pan as the Interceptor but offers a small step in the seat. The seats on our test bike were the optional single seat with a colour-matched cowl. Finally, the Continental GT uses a different way to mount the footpegs slightly further back. All in all, the lack of the centre stand and the other bits make the Continental GT 4kg lighter. Royal Enfield quotes 198kg as the kerb weight, versus 202 for the Interceptor. Both of these, oddly enough, are without fuel. 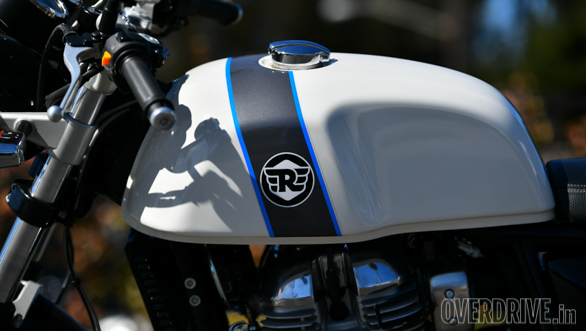 Factor in the fuel tanks and the Continental will be a little further lighter still, the cafe racer tank is 12.5 litres versus 13.75 litres for the Interceptor. The lines of the 650 aren't dissimilar to the Continental 535 but I think that this is a vastly better looking machine. While I don't think the 650 is overtly large or anything, the larger girth of the engine, slightly larger body panels, the aluminium rims and the tyres add up to a more fluent picture than the 535 was. Royal Enfield had more flexibility in terms of design and aggregates than the 535 because this is a new design and that shows in the significantly higher attention to detail and quality. Obviously, there aren't any fancy bits on the bike - it was built with a clear pricing intent, but Royal Enfield does offer a series of high quality, well finished accessories for exactly that purpose. I confirmed that the bar position on the Continental GT 650 was a bit taller than the 535 and that makes life a little bit easier. But this is still a lean forward riding position and long hours in the saddle will be a function of preference and fitness. But on the move, it allows you to feel just a hint more of what is going on and that fits my expectations of the Continental GT being slightly sportier in nature than the Interceptor. The engine is just as smooth, slick and refined as the Interceptor and the gearbox is a slick-shifting six-speed companion that is good to use. 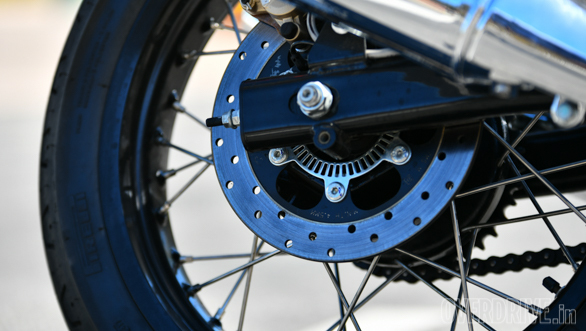 The torque comes on strong by 2,500rpm and peaks at 5,250rpm (52Nm). The sweetest spot is betweeen 4,000 and 6,000rpm and by 6,500rpm, the engine continues to pull but you quickly learn that upshfiting by 6,000rpm produces a satisfyingly urgent ride without any harshness at all, and a delicious burble-rumble from the stock pipes. I know many are surprised that we are calling the Royal Enfield 650 Twin so smooth etc but there's a clear engineering reason. The parallel twin format and the 270° firing order take care of a lot of the sources of vibration, using the reciprocity of moving parts to cancel each other out. The counterbalancer mops up whatever's left. By the standards of current Royal Enfield engines, this is a revelation. By the standards of current day parallel twins, this is not really a surprise. 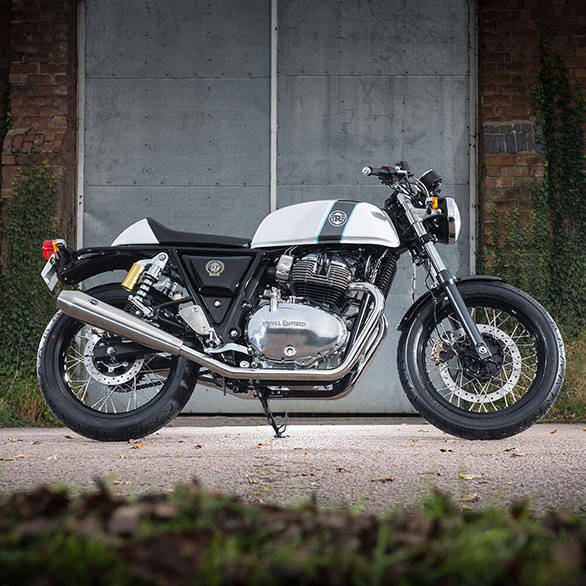 Just like the Interceptor, the Continental GT 650 will cruise happily between 80 and 120kmph. The latter is a smooth 5,000rpm in top (sixth) gear and while there is a slightest uptick in the sense of urgency or strain at 130kmph, I totally would cruise at 130 - the engine certainly allows it. Top speed is not clearly disclosed in the media documentation but we did manage 184kmph on the speedo at one point so it is fast enough to be sure. Royal Enfield set out to make a motorcycle that would be easy to ride for new riders and interesting for more experienced riders. But the core of the bike is its feel - it needed to feel engaging. From that perspective, the 24° of rake and 106mm of trail makes this is an easy motorcycle to ride. It isn't especially quick to turn, neither is it slow-witted. So corners feel natural at all kinds of speeds. The Pirelli Phantom SportsComp tyres feel stiff but you quickly learn that they're grippy and trustworthy. The issue we all noted was that once you get past 120kmph or so, it's not hard too notice that the Continental GT feels like it goes into a gentle wobble when you hit a bump when slightly leaned over. It doesn't ever get worse and settles after a couple of cycles. I think the Continental is more sensitive to this than the Interceptor but other journalists had the exact opposite opinion. That little wobble is there but only at high speeds and I don't think it's a dealbreaker - but it is one of the things I will be looking at closer when we get our hands on the bike in India. Ride quality is interesting. The GT feels just a bit stiffer than the Interceptor although the suspension is exactly the same. But just like the Interceptor, it absorbs hits that I don't expect it to, and then passes on other bumps that I think it should have handled. 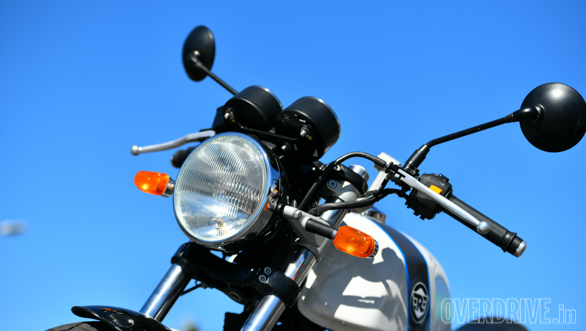 The California roads we rode had some bumpy sections within patches, tar snakes and undulations and to the motorcycle's credit, it never felt like I had to back off for the state of the road. 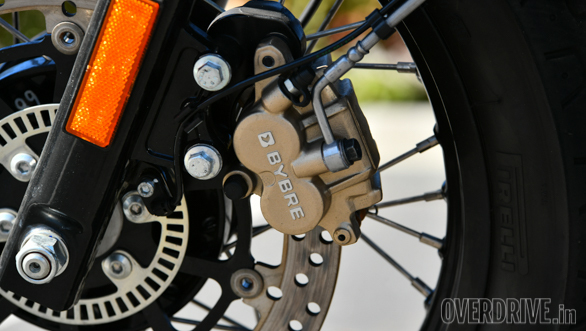 The brakes are nice and strong but the bite is well judged - anyone should be able to get along with them easily. 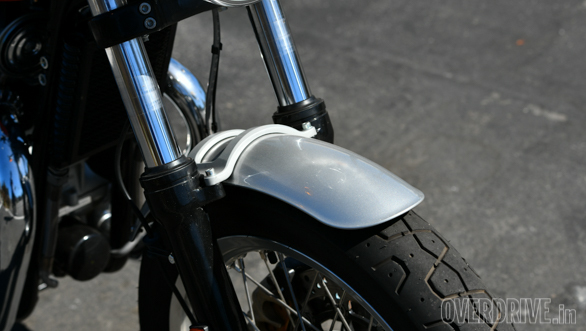 Dual-channel ABS is standard on both the motorcycles and you cannot turn it off. As you can see, Royal Enfield has made two motorcycles that totally stand out of every set of expectations that the average Indian motorcyclist has for products from their stable. These are well-made, high quality, refined motorcycles that have very few niggles. And the promise is that the motorcycle will also have a stunning price. In the US, the basic Interceptor is a barely believable five per cent (Rs 20,000-odd) more expensive than the Classic 500! Siddartha Lal clearly says the price, without cutting corners, was one of the goals of engineering these two. They didn't want it to be cheap. But they wanted a basic, simple motorcycle that they could price well, and one that would keep the rider engaged. The Continental GT, my feeling is, will not do as well as the Interceptor 650 in India, mostly because the lower handlebar position and single-seat format isn't everyone's cup of tea. But in many ways, Royal Enfield has never made a motorcycle anywhere close to this good, or threatened to have such stunning pricing. As Royal Enfield likes to say, "It's playtime." Very much so. And I think the games are just beginning and this match will be a lot of fun to watch!